In this article we review cell-to-cell communication in three groups of organisms: bacteria, fungi, and the amoeba Dictyostelium. In particular, we concentrate on cell-density-dependent quorum sensing, which seems to have evolved independently on several occasions. The biologic and chemical properties of select systems are outlined, and the way they affect transcription, often via cross-genome interactions, is described for each of the three groups. Furthermore, we give a short overview of the methods that can be used to study quorum sensing. We also outline the general properties of quorum sensing systems, such as positive feedback and its link to starvation-dependent pathways. Cell-to-cell signaling is a prerequisite for the development of multicellular organisms, such as animals and plants, but has also evolved in groups that would not usually be described as multicellular, such as bacteria and unicellular fungi. In this article we review and compare cell-to-cell signaling in several representative organisms, which are normally unicellular and never or only transiently aggregate to form multicellular bodies. Quorum sensing is a process of cell-to-cell communication by which individual cells regulate their phenotype in response to the extracellular concentration of pheromones. This regulation is achieved by the secretion of pheromones into the environment that bind sensory proteins and directly or indirectly affect transcription and translation. The binding threshold is assumed to be reached once the growing population, and hence the secreted pheromone, reaches a certain density. In what follows, we will use the term quorum sensing system to mean a cell-to-cell communication system in unicellular organisms, which functions via the secretion of pheromones into the environment and their subsequent binding to sensor proteins. The term pheromone as we use it here refers to any chemical molecule that is excreted by one organism and changes the behavior of another one. It is not necessary that the pheromone synthesis or detection machinery has evolved for this purpose, although this is often the case. Different systems can be distinguished by the different types of pheromones they use, which are normally associated with different types of signal synthesis, import and export, and reception and response machinery. In this article, we will concentrate on cell-to-cell communication in the form of quorum sensing in two unicellular groups, bacteria and yeast. Additionally, we will consider intercellular signaling in one species that is at the boundary between unicellularity and multicellularity, Dictyostelium discoideum. To illustrate the diverse mechanisms of cell-to-cell communication, we will discuss their biologic function, on the one hand, and the molecular details of pheromone synthesis, signal transduction, and transcription regulation in each of these groups, on the other hand. 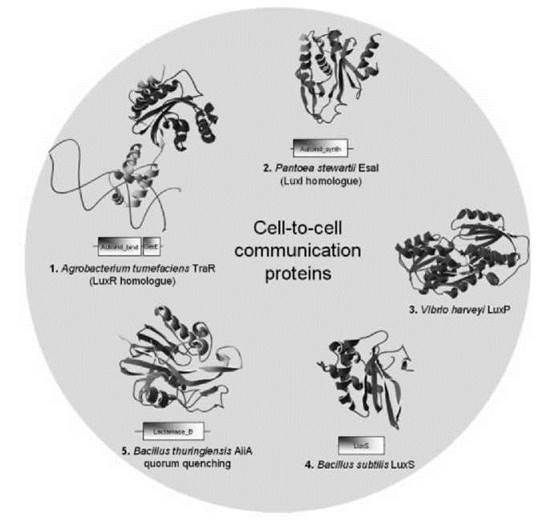 The study of cell-to-cell communication and its effects on transcription in unicellular organisms promises a variety of practical applications. One of them is the possibility of interfering with intercellular communication systems in pathogenic microbes, which is a process also referred to as quorum quenching. A short mention of this topic and a more general attempt to integrate cell-to-cell communication in unicellular organisms with other pathways and processes, such as starvation, will be given toward the end of this article. Although this article can be read by itself, we strongly recommend the reader consult the supplementary material on http://www.mrc-lmb.cam.ac.uk/genomes/awuster/wecb/ for links to additional literature and other relevant information. Quorum sensing involves dedicated cellular systems for the production and detection of pheromones, sometimes called quormones. In bacterial species that employ quorum sensing, each cell secretes a basal amount of pheromones at low cell density. As cell density increases, pheromone concentration also increases, provided that the cells are not too far apart. Pheromones bind to special receptors once their concentration exceeds a certain threshold, which in turn produces the physiologic response. It has been shown that in addition to population density, diffusion barriers can be sensed in the same way. For example, Staphylococcus aureus can induce quorum sensing-dependent genes when confined in a host endosome (1). It has even been proposed that most pathways attributed to quorum sensing in fact are diffusion-sensing pathways (2), although evidence for this is relatively scarce. In bacteria, quorum sensing-regulated phenotypes include bioluminescence, exopolysaccharide production, virulence, conjugal plasmid transfer, antibiotic and exoenzyme production, biofilm formation, and growth inhibition (3). Types of pheromones discussed in this section are acyl homoserine lactones (AHLs), AI-2 molecules, and modified oligopeptides. AHLs mostly affect transcription via a one-component signal transduction system, where the pheromone-binding protein domain is fused to a DNA-binding domain. Peptide pheromones and AI-2, on the other hand, often affect transcription via two-component signal transduction systems (TCSs) composed of a histidine kinase and a response regulator protein (4). As we shall see in the example of Vibrio harveyi, in some instances, the AI-2 signal transduction cascade can also be composed of more than two components. The structure of the pheromones as well as their cognate system components are listed in Table 1 (columns 1-3). Staphylococcus aureus autoinducing peptide (AIP, encoded by agrD). For columns 1-3, also see Fig. 1. Quorum sensing via acyl homoserine lactones is the best characterized bacterial cell-to-cell communication system. AHLs are often referred to as autoinducer-1-(AI-1)-type molecules. The term autoinducer has been chosen because synthesis of AHLs is regulated by positive feedback (Fig. 1), as has been discovered in the marine bacterium Vibrio fischeri (5). AHLs are composed of a homoserine lactone ring with an attached fatty acid chain, which can vary in length between 4 and 18 carbons and may or may not have a keto-group in position 3 (6, 7). For example, in V. fischeri, the AHL synthase LuxI produces 3OC6 homoserine lactone with a keto-group on the third of six carbons, but in Agrobacterium tumefaciens, the LuxI homologue TraI produces the 3OC8 molecule with a keto-group on the third of eight carbons. In most studied systems, AHLs are synthesized from S-adenosyl methionine (SAM) and fatty acid carrier proteins by LuxI and its homologues. However, alternative AHL synthases that are not homologous to LuxI exist. These synthases include LuxM in V. harveyi and HdtS in Pseudomonas fluorescens. In many species, more than one AHL is synthesized by different LuxI homologues. For example, in Rhizobium leguminosarum, six different AHLs synthesized by four different LuxI homologues have been identified (3). The structure of the LuxI homologue in P. aeruginosa has been resolved, and a detailed mechanism of its function has been proposed (8). Most AHLs cross membranes by diffusion and bind LuxR-like response regulators. LuxR-like response regulators are sensors and transcription factors at the same time (9), which makes the system a very simple one (Fig. 2a). Signal transduction systems in which the signal binding domain and the transcription regulating DNA binding domain are fused are referred to as one-component signal transduction systems. They are the most common type of bacterial signal transduction system (4, 10, 11). The N-terminal signal binding domain of LuxR-like proteins has a αβα-sandwich GAF domain-like fold. This occurrence is particularly interesting as GAF domains are usually found in signaling and sensor proteins (12). The structure of the A. tumefaciens LuxR homologue TraR (13) shows that at binding AHL is deeply embedded in the protein. Contact with some conserved hydrophobic and aromatic residues is established via several hydrogen bonds directly or via water. AHL binding is high affinity, which means that bacteria can sense relatively small pheromone concentrations. The specificity of the LuxR-like protein for AHL is determined by the acyl binding pocket of the LuxR homologue (14), as AHLs differ only in their acyl chains. The C-terminal domain belongs to the DNA and RNA binding helix-turn-helix fold. LuxR-like proteins use this domain to bind their cognate DNA motifs, such as the palindromic lux box in the case of V. fischeri in which it activates transcription of the luxICDABE operon. Because this operon encodes the AHL synthase LuxI, AHL synthesis is subject to positive feedback (Fig. 1). However, in other species, LuxR protein orthologues with AHL bound can act as transcriptional repressors, such as is the case for P. aeruginosa RhlR and LasR, which have been shown by microarray analysis (15, 16) to negatively regulate multiple genes. Many, but not all, LuxR homologues dimerize at the ligand binding the N-terminal domain. An example of this dimerization is the A. tumefaciens LuxR homologue TraR. Furthermore, it is likely that the conformational changes caused by ligand binding modify the DNA-binding abilities of the protein: Without AHL, decreased DNA affinity of TraR has been observed. It is also possible that ligand binding affects the LuxR protein ability to interact with RNA polymerase. Furthermore, AHL binding to LuxR has been shown to stabilize it, and in its absence, degradation is more likely (6). Because of the positive feedback effect AHLs have on regulating the transcription of their own synthases, concentrations of AHLs can vary enormously between lower density and higher density cultures, such as biofilms. P. aeruginosa 3OC12 homoserine lactone (with a keto-group on the third of the 12 carbons of the acyl chain) has been measured to have a concentration of 2-10 μM in a standard lab culture and of up to 600 μM in the vicinity of an in vitro biofilm (17). However, experimental sensitivity and issues with AHL stability might have influenced the above results. Although the basic AHL quorum sensing system only consists of two proteins—LuxI and LuxR—a variety of proteins modulates it. These proteins include the AiiA AHL lactonase of Bacillus thuringiensis, which inactivates AHL by hydrolyzing the homoserine lactone ring. It is an instance of quorum quenching, more examples of which will be given later. Other LuxR homologues, such as E. coli SdiA, recognize more than one AHL (6, 7), which might be because SdiA is probably used to detect AHL produced by other species, as no LuxI homologue has been detected in E. coli . Figure 1. Three bacterial quorum sensing systems (also see Table (1), columns 1 -3). The gray ovals represent cells; the small circles are the quorum sensing molecules (AHL, brown; AIP, light blue; furanosyl borate diester, violet). Receiver and signal transduction molecules in blue, DNA binding response regulators in green. Transcriptional interactions, green arrows; phosphorylation/dephosphorylation cascades, blue arrows; metabolic pathways, black arrows. Sender and receiver cells are only shown separately to keep the figure simple; in reality most cells in a population will receive and send signals at the same time. (a) The Vibrio fischeri AHL system, SAM: S-adenosyl methionine; (b) the Staphylococcus aureus AgrD system; (c) the Vibrio harveyi furanosyl borate diester system, SAH: S-adenosyl-L-homocysteine, MTAN: methylthioadenosine/S-adenosylhomocysteine hydrolase, DPD: dihydroxy pentadione. Interaction with other quorum sensing systems (CAI-1,3OC4 homoserine lactone; also see main text) not shown. An overlap of AHL signaling exists with other quorum sensing systems, such as observed in V. harveyi. Apart from an AHL system, V. harveyi has a parallel system whose signaling molecules are referred to as autoinducer-2 (AI-2). In V. harveyi, AI-2 is a furanosyl borate diester, whose precursor is 4,5-dihydroxy-2,3-pentanedione (DPD). DPD is synthesized by LuxS from S-adenosyl methionine (SAM). Thus, SAM is a precursor in both AHL synthesis and AI-2 synthesis. It is assumed that DPD spontaneously rearranges into AI-2 when borate is available (18). In other species this rearrangement does not occur, and AI-2 has a different structure. The homologues of the DPD synthase LuxS are distributed widely among bacteria, but it is not clear whether they all produce furanosyl borate diesters. For example, LuxS in S. aureus was not shown to have any involvement in quorum sensing (19), because LuxS is not devoted solely to AI-2 production but also has a function in the methionine metabolic pathway. In V. harveyi, in the absence of the AI-2 pheromone, the membrane-bound kinase LuxQ undergoes autophosphorylation on a conserved histidine residue (20, 21). The phosphoryl group is then transferred from the histidine of LuxQ to an aspartate of the response regulator LuxU. Phospho-LuxU in turn phosphorylates LuxO. Phospho-LuxO together with the sigma factor o54 then activates transcription of a set of small RNAs (Fig. 1c). These small RNAs, together with the RNA chaperone Hfq, contribute to the degradation of the mRNA of the LuxR transcription factor. LuxR is therefore the ultimate effector of the system in the presence of AI-2 in V. harveyi. It is important to distinguish this LuxR from the nonhomologous LuxR protein that binds AHL in V. fischeri as discussed in the previous section. In the presence of the AI-2 pheromone, AI-2 is bound by LuxP (Fig. 2c), which is a periplasmic binding protein. LuxP-AI-2 binding to the LuxQ kinase triggers a dephosphorylation cascade by turning the kinases into phosphatases. LuxQ dephosphorylates LuxU, and LuxU dephosphorylates LuxO. The result is that the mRNA of the transcription factor LuxR is no longer degraded by sRNAs, and it can regulate its target genes (22). Interestingly, LuxU can also be phosphorylated by two other mechanisms. The first mechanism involves 3OC4 homoserine lactone that binds to the LuxN sensor kinase, which in turn dephosphorylates LuxU. The second mechanism acts via the unidentified autoinducer CAI-1. Thus, AI-2, 3OC4 homoserine lactone, and CAI-1 funnel their signals into one common system. Furthermore, sensing of the AHL 3OC4 homoserine lactone by a membrane-bound kinase in V. harveyi shows that AHLs can also be sensed by pathways that are dissimilar to the one-component pathway outlined in the previous section. AHLs are found only in Gram-negative bacteria, whereas AI-2 regulates phenotypes in genera as diverse as the firmicute B. subtilis and the y-proteobacterium V. harveyi. As a result, AI-2 has been proposed to be involved in interspecies communication (23). Homologues of LuxQ have only been found in Vibrio species. Therefore, it can be assumed that sensing of AI-2 occurs in a different way in other species. For example, in E. coli and Salmonella typhimurium, AI-2 is imported into the cytoplasm by an ATP binding cassette (ABC) transporter. This transporter recognizes the periplasmic protein LsrB, which has the same periplasmic binding fold as LuxP. AI-2 is then phosphorylated by the cytoplasmic kinase LsrK. It has been suggested that phospho-AI-2 subsequently interacts with the transcription factor LsrR (24). Figure 2. Representative domain organization and structure of some proteins involved in cell-to-cell communication. (a) The AHL binding transcription factor TraR; (b) EsaI, a LuxI homologue and involved in AHL synthesis; (c) LuxP, a periplasmic protein binding AI-2; (d) LuxS, a protein involved in AI-2 synthesis; (e) the quorum quenching enzyme AiiA. Many Gram-positive bacteria use processed oligopeptides as pheromones. The precursor peptides are typically between 40 and 65 amino acid residues in length. These pre-peptides are processed (cleaved) in all known cases, and the resulting peptide pheromones are typically 5 to 34 residues in length. In many cases the peptides are also modified. The minimum components for peptide communication, apart from the peptide signal itself, are a membrane-bound histidine kinase and a response regulator with an aspartate phosphorylation residue. These components constitute a two-component signal transduction system, as opposed to the one-component system observed in AHL-based communication. Peptide communication systems include the competence stimulating factor (CSF) of B. subtilis, which is a pentapeptide (sequence: ERGMT) derived from the 5 carboxy-terminal amino acids of the 40-amino-acid peptide encoded by phrC (25). Other systems include the lantibiotic nisin in Lactococcus lactis, which positively regulates its own expression. Staphylococcus epidermidis has a similar system to the lantibiotic epidermin (26). A peptide pheromone discovered in S. aureus is the au- toinducing peptide (AIP), which is derived from the precursor AgrD to which a thiolactone ring is added between the carboxyl residue and a Cysteine residue at position 5 (Table 1, column 2) by AgrB. The AIP is sensed by the AgrC sensor kinase, which may dimerize at signal binding. The signal is then passed on to the AgrA response regulator, which activates transcription of the agr operon (6, 27), therefore again leading to autoinduction. Both AgrD and ComX, another peptide pheromone precursor found in B. subtilis, have an amphipathic motif in their N-terminal region, which might serve the purpose of recruiting the peptide to the membrane where it can be processed (28). This recruitment is often done by a dedicated ATP binding cassette (ABC) transporter, which in some cases recognizes a so-called GG leader sequence (consensus sequence LSxxELxxIxGG) to the N-terminus of the region that encodes the actual signal (29). Peptide signals might be more flexible than the small molecules discussed, as they do not require a specialized synthase and can change to adapt to ecological niches by simple codon mutation (30). The observation that some genes encoding peptide signals are more variable than other genes might be an indication that this actually happens. Furthermore, peptides might also be more flexible in the sense that they could be modulated by the external environment of a cell, therefore serving some kind of sensor function in addition to their function as communication molecules. It can be caused by the external environment (for example, pH, temperature, salinity, the presence of certain chemicals or enzymes including proteases) modifying the communication peptides, therefore changing their ability to change the activity of the sensor histidine kinase and the subsequent signaling cascade (30). Other bacterial quorum sensing systems include the P. aeruginosa quinolone signal (PQS; 2-heptyl-3-hydroxy-4-quinolone) synthesized by PqsH, which is hydrophobic and is exported out of the cell by a vesicular transport system analogous to the ones used by eukaryotes. It seems that PQS is directly facilitating vesicle formation, as pqsH mutants do not produce vesicles. However, the phenotype can be rescued by the addition of exogenous PQS. The advantages of vesicle formation in P. aeruginosa might include the high concentration of vesicle contents delivered, as well as a certain resistance to quorum quenching signal degrading substances (31). Thepqs genes have also been found in Burkholderia, although the production of PQS in these species could not be confirmed. In Streptomyces y-butyrolactone, a molecule structurally resembling AHLs has been shown to be a quorum sensing signal (22). Interestingly, in the genome of the Rhodococcus strain, RHA1 homologues for protein domains of both the γ-butyrolactone synthase and the receptor can be found, which suggests that γ-butyrolactone might play a role in this organism too. This suggestion is in agreement with close genomic proximity of the synthase genes and the response regulator genes (AW, MMB, unpublished results). Fruiting body formation in the bacterium Myxococcus xanthus is facilitated by the diffusible A-signal, which seems to consist of six different amino acids generated by extracellular proteolysis, and the contact-dependent C-signal. The C-signal is a cell-surface protein (32). Contact-dependent communication has also been observed in E. coli, where it is facilitated by CdiA and CdiB and leads to growth inhibition (33). Potential CdiAB homologues have been identified in a wide range of bacteria. The list discussed here is by no means complete (for a comprehensive list, see Reference (34)), and it is reasonable to expect that even more bacterial quorum sensing systems await discovery, especially when considering the vast amounts of microbial diversity made available by metagenomics projects. (35). Quorum quenching often takes the form of enzymes degrading the pheromones. Two different sorts of enzymes doing this for AHLs have been described: AHLases [e.g., AiiA in B. thuringiensis (Fig. 2e)] hydrolyze the lactone ring, resulting in acyl homoserine, but AHL-acylases (e.g., AiiD) break the amide bond, cleaving homoserine lactone from the acyl side chain (36, 37). Quorum signals can also be quenched by organisms that do not produce the signals, presumably to gain an advantage over communicating bacterial species in the same ecological niche. For example, Rhodococcus can degrade AHL signals without having any known ability to produce them (38). On the one hand, closely related bacterial strains can produce surprisingly diverse quorum sensing molecules. For example, in the AIP system, the gene regions encoding the AIP precursor AgrD are extremely variable between strains (30). The purpose of this is most likely to avoid quorum sensing interference between strains living in the same niche. On the other hand, identical quorum sensing molecules are used by a wide variety of bacterial species, such as seems to be the case for AI-2. In fact, quorum sensing molecules can have effects outside the eubacterial kingdom, interfering with transcription in eukaryotes. One reason why quorum sensing molecules might have an influence on eukaryotic gene expression might be in order to enable the eukaryote to respond to bacterial infection in a more timely fashion by being able to sense bacterial presence sooner than would normally be possible. Another possibility is that interference with eukaryotic transcription is in the interest of the bacteria, causing the host to express genes that create a more favorable environment. This interference is of particular relevance for pathogenic bacteria, such as P. aeruginosa, a pathogen of humans that infects all sorts of organs, including the lungs of cystic fibrosis (CF) patients. In the mouse model for CF, it has been shown that the P. aeruginosa 3OC12 homoserine lactone induces and represses the expression of several mouse genes, including the chemokine interleukin-8 (IL-8). IL-8 causes the migration of neutrophils to the site of infection. If these neutrophils become activated, this can then lead to tissue damage. Although the exact molecular mechanism of how AHLs can regulate eukaryotic transcription is not yet known, at least four possibilities exist: 1) AHLs have been shown to be able to cross mammalian cell membranes, which means that inside the cell they could bind specialized receptor molecules, although no such molecules have been identified yet, 2) The AHLs could regulate the function of enzymes in a nonspecific manner and therefore modulate metabolic pathways, 3) The AHLs could directly act as nonspecific substrates in metabolic pathways. 4) The AHLs could bind membrane-associated receptors without entering the cell and possibly could disrupt host signaling (17). Another way in which quorum sensing can be disrupted is by pheromone analogs that have similar structures and functions as agonists or antagonists to the actual molecules. In Staphylococcus, where quorum sensing is also mediated by peptides, different strains use slightly different, but homologous, peptides. These peptides tend to interfere with each other and inhibit the quorum sensing cascades of other strains (23). Eukaryotes can use a similar approach by synthesizing molecules that mimic AHLs, as has been demonstrated in plants (39). The advantage of this approach might be that in this way pathogenic bacteria are exposed to a high level of pheromones earlier in the infectious process than they would normally be, therefore “confusing” them by suggesting a higher population density than is actually the case. This situation can cause the premature expression of virulence genes, which gives the host immune system more time to respond (17). In yeasts, several workers report on putative quorum sensinglike mechanisms. In all reported cases, the major phenotype affected by quorum sensing is the transition between the filamentous form and the solitary yeast form. For example, Histoplasma capsulatum is a parasitic yeast that can exist either in its filamentous form in soil or in its yeast form as a parasite of humans. Once it enters the host, its morphology switches to the yeast form that synthesizes cell-wall polysaccharides, such as α-(1,3)-glucan. It has been shown that the glucan concentration increases in a cell-density-dependent fashion. A culture grown in fresh medium to which filtrate from a dense culture is added will produce glucan, which suggests the existence of a factor that promotes glucan incorporation into the cell wall (see the section “Tools and Techniques” for more details on this approach). Very similar results have been reported for the causative agent of the Dutch Elm disease, Ceratocystis ulmi. The existence of a couple of different quorum sensing molecules has been reported for the human pathogen Candida albicans. At low densities, the cells develop germ tubes (filamentous protrusions), which are not observed normally at high cell densities, which suggests that the switch between unicellular yeast and filamentous form depends on cell density. A molecule that blocks the formation of these germ tubes at high cell densities has been identified as farnesol, which has only been observed to have this function in C. albicans (40). Farsenol, as used for communication in C. albicans, consists of an OH group and a branched C15 side chain. Farnesol acts by affecting transcription. The product of TUP1 is a transcriptional repressor that regulates the yeast-to-filamentous transition by negatively regulating the transcription of hyphen-specific genes. TUP1 expression has been shown to be increased by farnesol. Indicating some sort of feedback, in tup1 ∆/tup1∆, as well as other obligatorily filamentous knockouts, farnesol production is increased (41). Another molecule involved in the high-to-low cell density transition identified in C. albicans is tyrosol (42). As opposed to farnesol, it promotes cell growth and the development of germ tubes at low cell densities. Expression profiling of cultures under conditions of reduced tyrosol concentration showed reduced expression of proteins involved in DNA synthesis and cell cycle regulation (43). Other putative C. albicans quorum sensing molecules include the substance MARS of unknown identity and, with diminutive effect, farsenoic acid (41). A more detailed picture of density dependent cell-to-cell communication has been uncovered for Saccharomyces cerevisiae (44). In this fungus, phenylethanol (a phenylalanine aromatic alcohol derivative) and tryptophol (a tryptophan aromatic alcohol derivative) have been implicated in quorum sensing, and a model of how they act on their target genes has been proposed (Table 1, column 5). As in the other examples of yeast quorum sensing discussed above, these molecules regulate the transition to the filamentous form. They synergistically affect the upreg- ulation of FLO11 via the cAMP-dependent kinase Tpk2p (a PKA subunit) and the transcription factor Flo8p. Flo11p, the product of FLO11, is the GPI-anchored cell-surface flocculin protein and is essential for filamentous growth. S. cerevisiae strains with deletions of either TPK2 or FLO8 do not form filaments in response to aromatic alcohols (44). As in bacterial quorum sensing, the production of these two aromatic alcohols is cell-density dependent. Another similarity to bacterial quorum sensing is the autostimulatory fashion of pheromone production. Aro9p is an aromatic aminotransferase and catalyzes the first step of tryptophan, phenylalanine, and tyrosine catabolism. The expression of the genes ARO9 and ARO10 is induced by tryptophol via the Aro80p transcription factor. 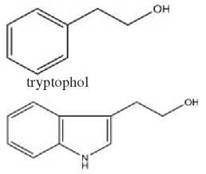 Both ARO9 and ARO10 are required to synthesize tryptophol from tryptophan. It has been speculated that Aro10p is also involved in the aromatic amino acid catabolic pathway (45). As tryptophol induces the enzymes required for its own synthesis, it results in a positive feedback loop. Therefore, cells at high densities produce more aromatic alcohols per cell than cells at low density. Together with C. albicans and many other yeast species, S. cerevisiae switches to the filamentous form when starved of nitrogen. The signal conferring information about nitrogen shortage has not been characterized in detail yet. Its message is transmitted via a MAPK-PKA pathway and results in an increase in the transcription of filamentation genes. Overlaps of tryptophol/phenylethanol communication with the nitrogen sensing pathway exist: Ammonia (nitrogen rich condition) represses filamentous growth as well as the expression of the above-mentioned ARO9 and ARO10 genes. However, elements of the MAPK-PKA pathway do not seem to be affected by aromatic alcohol communication. Microarray data show that aromatic alcohols upregulate the expression of around 150 genes by twofold or more. These genes have diverse functions, but it is remarkable that 70% of them were shown independently to be upregulated upon entry into stationary phase. In contrast to S. cerevisiae, C. albicans filamentation is not stimulated by tryptophol or phenylethanol, although high concentrations of tyrosol were shown to slightly stimulate biofilm formation. This result shows that the function of the aromatic alcohol quorum sensing system of S. cerevisiae is not conserved in C. albicans (44). D. discoideum is a protozoan that is closely related to opisthokonts, the group comprising animals and fungi. The Dictyostelium amoebae are interesting from the point of view of cell-to-cell communication: not only starvation-dependent signaling but also a complex network of developmental intercellular signaling is observed (46). It is a well-reviewed fact (for a review see Reference 47) that in Dictyostelium starvation triggers a behavior that causes aggregation of the single amoeba. The signal controlling this behavior is cyclic AMP (cAMP). Genes involved in cAMP signaling include the receptor for extracellular cAMP (CAR1) and the cAMP synthase, adenylyl cyclase (ACA). Interestingly, expression of these genes increases even before starvation sets in toward the end of the exponential growth phase. The amoebae can discern that genes required for the starvation response should be expressed by sensing their local population density. A high population density means that more nutrients are consumed and that future starvation is more likely. The amoebae can sense population density in a similar way to quorum sensing in bacteria. Glycoproteins, termed prestarvation factors or PSFs, are secreted into the environment at a basal level. Once their concentration exceeds a certain level, the genes required for cAMP signaling are upregulated (48). The exact mode of function of the two PSFs identified so far has yet to be determined (49). Once the amoebae have gathered in response to cAMP signaling, they form a multicellular structure surrounded by an extracellular matrix. This structure has many characteristics of development, such as differential cell sorting, pattern formation, or cell-type regulation. Although these characteristics can also be observed in animals, in Dictyostelium, multicellularity seems to have evolved independently (50). To reproduce, the cells of the Dictyostelium slugs differentiate into two basic cell types, known as prespore and prestalk cells. The prespore cells are relatively homogeneous, whereas there are several prestalk cell subtypes. The prestalk cell subtypes can be distinguished by using the promoters of the extracellular matrix genes ecmA and ecmB. By using these genes to control the expression of reporter genes, it is possible to differentiate between prespore and prestalk cells. The recent sequencing of the Dictyostelium genome has shown that it shares many genes with higher eukaryotes, such as animals, which are not found in fungi. Because fungi are more closely related to animals than to Dictyostelium, this suggests loss of these genes in fungi. An example of a category of such genes is the transmembrane G-protein-coupled receptors (the cAMP receptor-like family). Three families of G-protein-coupled receptors that were thought to be unique to animals prior to the sequencing of the Dictyostelium genome are the frizzled/smoothened, secretin, and metabotropic glutamate/ GABAB families (50). Another finding resulting from the sequencing of the Dictyostelium genome is the relative abundance of genes encoding polyketide synthases (51). Polyketide synthases are needed for the synthesis of many molecules involved in developmental signaling in Dictyostelium, some of which will be discussed here. Differentiation inducing factors (DIFs; see Table 1, column 4) are polyketide-derived signaling molecules critical for orchestration of cellular differentiation. DIF-1, a chlorinated hexanophenone (1-3,5-dichloro-2,6-dihydroxy-4-methoxyphenyl) hexan-1-one), has been proposed to induce formation of prestalk cells by activating the expression of prestalk specific genes such as ecmA mentioned above. DIF-1 concentration is regulated by negative feedback, wherein DIF-1 activates the DIF-1 dechlorinase, which in turn inactivates it. However, DIF-1 clearly cannot be the only factor involved in prestalk development as mutants blocked in the final step of DIF-1 biosynthesis, which is catalyzed normally by an O-methyltransferase, still produce pstA cells and develop aberrant fruiting bodies. The way in which DIF-1 regulates the expression of its target genes might be via DimA and DimB, which are DNA binding basic leucine zipper proteins that migrate to the nucleus on exposure to DIF-1. The inability of mutants with a dimA deletion to express ecmA in response to DIF-1 is consistent with the idea that DimA and DimB are DIF-1-activated transcription factors (46). DIF biosynthesis has been investigated recently (52), and the protein Steely has been described as a key enzyme. Steely consists of six fatty acid synthase (FAS) catalytic domains and a C-terminal polyketide synthase (PKS). The N-terminal acyl products of steely are transferred to the C-terminal PKS active sites, which then catalyze polyketide extension and cyclisation. The result is a phlorocaprophenone, which is chlorinated subsequently and finally methylated. Recent research (51) has shown that two putative DIF-1 precursors, 1-(3,5-dichloro-2,4,6-trihydroxyphenyl)hexan-1-one and 1-(3-chloro-2,4,6-trihydroxyphenyl)hexan-1-one, are also inducers of stalk development. This indicates that the desmethyl and desmethyl-monochloro analogs of DIF-1 are sufficient for stalk formation, which does not exclude the possibility that the methyl forms serve a different purpose. A third stalk-inducing compound identified in the same study was 4-methyl-5-pentylbenzene-1,3-diol. From current data, it can be assumed that signaling complexity in Dictyostelium development is higher than previously thought (51), which is also reinforced by the insight that development requires highly selective signaling systems (50). The description of the systems given here, including the PSF system and the DIF systems, is therefore far from exhaustive. The identification of cell-to-cell communication molecules is a nontrivial task. At an abstract level, a simple assay that allows for ascertaining if a certain phenotype is influenced by quorum sensing is to grow cells in culture in stationary phase for some time. During that period, potential pheromones can accumulate. The cells are then filtered and/or centrifuged out of the growth medium and the remainder is purified. If the addition of this conditioned medium to fresh exponentially growing cells induces the phenotype in question, one possible explanation is that quorum sensing molecules affecting the phenotype were present in the filtrate. High-resolution liquid chromatography/mass spectrometry (LC/MS) and nuclear magnetic resonance (NMR) spectroscopy can aid in the identification of the actual quorum sensing molecules by enabling the researcher to compare the spectra of synthetic molecules to molecules purified from the conditioned medium. Genetic techniques to investigate quorum sensing include the disruption of the genes in a pathway that produces quorum sensing molecules, knockout of sensor and response regulator genes, addition of purified or synthetic quorum sensing molecules, or addition of quorum quenchers. The identity of synthetic and actual (purified) communication molecules can be verified by adding synthetic molecules to a mutant culture that cannot produce its own signals. If the phenotypic effects are the same, this indicates that the synthetic and purified molecule share the same structure. It can, however, also happen that chemically analogous molecules elicit similar effects. For example, the quorum sensing homoserine lactone 3OC12 as produced by the bacterium P. aeruginosa has been shown to mimic the effects of farsenol in C. albicans, probably because it is somewhat similar in its side chain structure. Quorum sensing can also be studied from a different viewpoint, for example, by computational methods. The structure of many quorum sensing molecules as well as of their cognate synthases and receptor molecules has been solved by X-ray diffraction analysis or NMR. A list of PDB entries associated with quorum sensing is available from the supplementary materials section on http://www.mrc-lmb.cam.ac.uk/genomes/awuster/wecb/, and some structures are shown in Fig. 2. These structures provide invaluable insights in determining the molecular mechanisms of quorum sensing. Similarly gene expression microarray datasets under quorum sensing conditions are available publicly. Integrating structural and gene expression data with the abundantly available genome sequence data will therefore be of great value for the discovery of new quorum sensing systems as well as for the integration of quorum sensing with intracellular signaling pathways. It is easy to see that in a growing population limited resources will become scarce sooner or later, which suggests that there is a fundamental link among population density, growth, and starvation. One such link has been uncovered in P. aeruginosa, where an AHL induces the transcription of the gene encoding σS, a sigma factor that is active maximally under conditions of starvation (53). In yeast, the link has been demonstrated in S. cerevisiae with ammonia—often a limiting resource for growth—inhibiting the expression of ARO9 and ARO10, two enzymes involved in the production of the aromatic alcohols functioning as quorum sensing pheromones. In Dictyostelium, the pre-starvation factors regulate changes in gene expression in a cell-density-dependent manner toward the end of the exponential phase during the vegetative cycle to be prepared for the secretion of cAMP, which is the starvation signal and leads to the aggregation of cells. Positive feedback is another theme common to quorum sensing systems. The purpose of positive feedback during quorum sensing is presumably to speed up the response time, or to give a more pronounced response. In many of the discussed cases, positive feedback takes the form of quorum sensing molecules increasing the expression of their own synthases, such as in yeast where the aromatic alcohols, via the transcription factor Aro80p, promote the expression of ARO9 and ARO10. Similarly, in the bacterial LuxI/LuxR system, the AHLs synthesized by LuxI promote their own synthesis when bound to LuxR by positively regulating the expression of the luxICDABE operon. One result that can be anticipated from this is that cells at high densities secrete more autoinducer per cell than cells at low densities. Interest in cell-to-cell communication in unicellular organisms is still increasing, which might also be because of two important realizations, the first one of which is the relevance of quorum sensing to many disease-related processes, for which P. aeruginosa with its multiple and interacting systems has become a model organism. Furthermore, interaction between eukaryotic hosts and microbial pathogens via quorum sensing molecules might prove to be of high importance for furthering our understanding of bacterial infectious diseases. The second realization is that quorum sensing is not limited to a few species but that it seems to be a next-to-universal mechanism in unicellular organisms, with a multitude of quorum sensing systems likely to be awaiting discovery. AW and MMB acknowledge financial support from the Medical Research Council. We would like to thank Sarath Chandra Janga, Subhajyoti De, and Siarhei Maslau for critically reading the manuscript. 1. Qazi SN, Counil E, Morrissey J, Rees CE, Cockayne A, Winzer K, Chan WC, Williams P, Hill PJ. agr expression precedes escape of internalized Staphylococcus aureus from the host endosome. Infect. Immun. 2001; 69:7074-7082. 2. Redfield RJ. Is quorum sensing a side effect of diffusion sensing? Trends Microbiol. 2002; 10:365-370. 3. Lazdunski AM, Ventre I, Sturgis JN. Regulatory circuits and communication in Gram-negative bacteria. Nat. Rev. Microbiol. 2004; 2:581-592. 4. Ulrich LE, Koonin EV, Zhulin IB. One-component systems dominate signal transduction in prokaryotes. Trends Microbiol. 2005; 13:52-56. 5. Nealson KH, Platt T, Hastings JW. Cellular control of the synthesis and activity of the bacterial luminescent system. J. Bacteriol. 1970; 104:313-322. 6. Reading NC, Sperandio V. Quorum sensing: the many languages of bacteria. FEMS Microbiol. Lett. 2006; 254:1-11. 7. Whitehead NA, Barnard AM, Slater H, Simpson NJ, Salmond GP. Quorum-sensing in Gram-negative bacteria. FEMS Microbiol. Rev. 2001; 25:365-404. 8. Gould TA, Schweizer HP, Churchill ME. Structure of the Pseudomonas aeruginosa acyl-homoserinelactone synthase LasI. Mol. Microbiol. 2004; 53(:1135-1146. 9. Choi SH, Greenberg EP. The C-terminal region of the Vibrio fischeri LuxR protein contains an inducer-independent lux gene activating domain. Proc. Natl. Acad. Sci. U.S.A. 1991; 88:11115- 11119. 10. Aravind L, Anantharaman V, Balaji S, Babu MM, Iyer LM. The many faces of the helix-turn-helix domain: transcription regulation and beyond. FEMS Microbiol. Rev. 2005; 29:231-262. 11. Madan Babu M, Teichmann SA. Evolution of transcription factors and the gene regulatory network in Escherichia coli. Nucleic Acids Res. 2003; 31:1234-1244. 12. Aravind L, Ponting CP. The GAF domain: an evolutionary link between diverse phototransducing proteins. Trends Biochem. Sci. 1997; 22:458-459. 13. Zhang RG, Pappas T, Brace JL, Miller PC, Oulmassov T, Molyneaux JM, Anderson JC, Bashkin JK, Winans SC, Joachimiak A. Structure of a bacterial quorum-sensing transcription factor complexed with pheromone and DNA. Nature 2002; 417:971-974. 14. Camilli A, Bassler BL. Bacterial small-molecule signaling pathways. Science 2006; 311:1113-1116. 15. Schuster M, Lostroh CP, Ogi T, Greenberg EP. Identification, timing, and signal specificity of Pseudomonas aeruginosa quorum-controlled genes: a transcriptome analysis. J. Bacteriol. 2003; 185:2066-2079. 16. Wagner VE, Bushnell D, Passador L, Brooks AI, Iglewski BH. Microarray analysis of Pseudomonas aeruginosa quorum-sensing regulons: effects of growth phase and environment. J. Bacteriol. 2003; 185:2080-2095. 17. Shiner EK, Rumbaugh KP, Williams SC. Inter-kingdom signaling: deciphering the language of acyl homoserine lactones. FEMS Microbiol. Rev. 2005; 29:935-947. 18. Chen X, Schauder S, Potier N, Van Dorsselaer A, Pelczer I, Bassler BL, Hughson FM. Structural identification of a bacterial quorum-sensing signal containing boron. Nature 2002; 415:545- 549. 19. Doherty N, Holden MT, Qazi SN, Williams P, Winzer K. Functional analysis of luxS in Staphylococcus aureus reveals a role in metabolism but not quorum sensing. J. Bacteriol. 2006; 188:2885-2897. 20. Neiditch MB, Federle MJ, Miller ST, Bassler BL, Hughson FM. Regulation of LuxPQ receptor activity by the quorum-sensing signal autoinducer-2. Mol. Cell 2005; 18:507-518. 21. Neiditch MB, Federle MJ, Pompeani AJ, Kelly RC, Swem DL, Jeffrey PD, Bassler BL, Hughson FM. Ligand-induced asymmetry in histidine sensor kinase complex regulates quorum sensing. Cell 2006; 126:1095-1108. 22. Waters CM, Bassler BL. The Vibrio harveyi quorum-sensing system uses shared regulatory components to discriminate between multiple autoinducers. Genes Dev. 2006; 20:2754-2767. 23. Bassler BL, Losick R. Bacterially speaking. Cell 2006; 125:237- 246. 24. Xavier KB, Miller ST, Lu W, Kim JH, Rabinowitz J, Pelczer I, Semmelhack MF, Bassler BL. Phosphorylation and processing of the quorum-sensing molecule autoinducer-2 in enteric bacteria. ACS Chem. Biol. 2007; 2:128-136. 25. Solomon JM, Lazazzera BA, Grossman AD. Purification and characterization of an extracellular peptide factor that affects two different developmental pathways in Bacillus subtilis. Genes Dev. 1996; 10:2014-2024. 26. Kleerebezem M, Quadri LE, Kuipers OP, de Vos WM. Quorum sensing by peptide pheromones and two-component signal- transduction systems in Gram-positive bacteria. Mol. Microbiol. 1997; 24:895-904. 27. Ji G, Beavis R, Novick RP. Bacterial interference caused by autoinducing peptide variants. Science 1997; 276:2027-2030. 28. Zhang L, Lin J, Ji G. Membrane anchoring of the AgrD N-terminal amphipathic region is required for its processing to produce a quorum-sensing pheromone in Staphylococcus aureus. J. Biol. Chem. 2004; 279:19448-19456. 29. Dirix G, Monsieurs P, Marchal K, Vanderleyden J, Michiels J. Screening genomes of Gram-positive bacteria for double-glycine- motif-containing peptides. Microbiology 2004; 150:1121-1126. 30. Morrison DA. Is anybody here?Cooperative bacterial regulation via peptide signals between Gram-positive bacteria. In Signals, Switches, Regulons, and Cascades. Hodgson DA, Thomas CM, eds. 2002; Cambridge University Press, Cambridge, UK. pp. 231-249. 31. Mashburn LM, Whiteley M. Membrane vesicles traffic signals and facilitate group activities in a prokaryote. Nature 2005; 437:422-425. 32. Kaiser D. Signaling in myxobacteria. Annu. Rev. Microbiol. 2004; 58:75-98. 33. Aoki SK, Pamma R, Hernday AD, Bickham JE, Braaten BA, Low DA. Contact-dependent inhibition of growth in Escherichia coli. Science 2005; 309:1245-1248. 34. Shapiro JA. Thinking about bacterial populations as multicellular organisms. Annu. Rev. Microbiol. 1998; 52:81-104. 35. Tang HB, DiMango E, Bryan R, Gambello M, Iglewski BH, Goldberg JB, Prince A. Contribution of specific Pseudomonas aeruginosa virulence factors to pathogenesis of pneumonia in a neonatal mouse model of infection. Infect. Immun. 1996; 64:37-43. 36. Park SY, Hwang BJ, Shin MH, Kim JA, Kim HK, Lee JK. N-acylhomoserine lactonase producing Rhodococcus spp. with different AHL-degrading activities. FEMS Microbiol. Lett. 2006; 261:102-108. 37. Leadbetter JR, Greenberg EP. Metabolism of acyl-homoserine lactone quorum-sensing signals by Variovorax paradoxus. J. Bacteriol. 2000; 182:6921-6926. 38. Jafra S, Przysowa J, Czajkowski R, Michta A, Garbeva P, Van der Wolf JM. Detection and characterization of bacteria from the potato rhizosphere degrading N-acyl-homoserine lactone. Can. J. Microbiol. 2006; 52:1006-1015. 39. Gao M, Teplitski M, Robinson JB, Bauer WD. Production of substances by Medicago truncatula that affect bacterial quorum sensing. Mol. Plant Microbe. Interact. 2003; 16:827-834. 40. Hornby JM, Jensen EC, Lisec AD, Tasto JJ, Jahnke N, Shoemaker R, Dussault P, Nickerson KW. Quorum sensing in the dimorphic fungus Candida albicans is mediated by farnesol. Appl. Environ. Microbiol. 2001; 67:2982. 41. Nickerson KW, Atkin AL, Hornby JM. Quorum sensing in dimorphic fungi: farnesol and beyond. Appl. Environ. Microbiol. 2006; 72:3805-3813. 42. Chen H, Fujita M, Feng Q, Clardy J, Fink GR. Tyrosol is a quorum-sensing molecule in Candida albicans. Proc. Natl. Acad. Sci. U. S. A. 2004; 101:5048-5052. 43. Sprague GF Jr, Winans SC. Eukaryotes learn how to count: quorum sensing by yeast. Genes Dev. 2006; 20:1045-1049. 44. Chen H, Fink GR. Feedback control of morphogenesis in fungi by aromatic alcohols. Genes Dev. 2006; 20:1150-1161. 45. Iraqui I, Vissers S, Andre B, Urrestarazu A. Transcriptional induction by aromatic amino acids in Saccharomyces cerevisiae. Mol. Cell Biol. 1999; 19:3360-3371. 46. Williams JG. Transcriptional regulation of Dictyostelium pattern formation. EMBO Rep. 2006; 7:694-698. 47. Aubry L, Firtel R. Integration of signaling networks that regulate Dictyostelium differentiation. Annu. Rev. Cell Dev. Biol. 1999; 15:469-517. 48. Soderbom F, Loomis WF. Cell-cell signaling during Dictyostelium development. Trends Microbiol. 1998; 6:402-406. 49. Morita T, Amagai A, Maeda Y. Translocation of the Dictyostelium TRAP1 homologue to mitochondria induces a novel prestarvation response. J. Cell Sci. 2004; 117:5759-5770. 50. Eichinger L, Pachebat JA, Glockner G, Rajandream MA, Sucgang R, Berriman M, Song J, Olsen R, Szafranski K, Xu Q, et al. The genome of the social amoeba Dictyostelium discoideum. Nature 2005; 435:43-57. 51. Saito T, Taylor GW, Yang JC, Neuhaus D, Stetsenko D, Kato A, Kay RR. Identification of new differentiation inducing factors from Dictyostelium discoideum. Biochim. Biophys. Acta 2006; 1760:754-761. 52. Austin MB, Saito T, Bowman ME, Haydock S, Kato A, Moore BS, Kay RR, Noel JP. Biosynthesis of Dictyostelium discoideum differentiation-inducing factor by a hybrid type I fatty acid-type III polyketide synthase. Nat. Chem. Biol. 2006; 2:494-502. 53. Lazazzera BA. Quorum sensing and starvation: signals for entry into stationary phase. Curr. Opin. Microbiol. 2000; 3:177-182. Supplementary material available at: http://www.mrc-lmb.cam.ac.uk/genomes/awuster/wecb/. Bassler B, Losick R. Bacterially speaking. Cell 2006; 125:237-246. Camilli A, Bassler BL. Bacterial small-molecule signaling pathways. Science 2006; 311:1113-1116. Chen H, Fink GR. Feedback control of morphogenesis in fungi by aromatic alcohols. Genes Dev. 2006; 20:1150-1161. Fuqua C, Greenberg EP, Listening in on bacteria: acyl-homoserine lactone signaling. Nat. Rev. Mol. Cell Biol. 2002; 3:685-695. Lazdunski AM, Ventre I, Sturgis JN. Regulatory circuits and communication in Gram-negative bacteria. Nat. Rev. Microbiol. 2004; 2:581- 592. Williams JG. Transcriptional regulation of Dictyostelium pattern formation. EMBO Rep. 2006; 7:694-698.